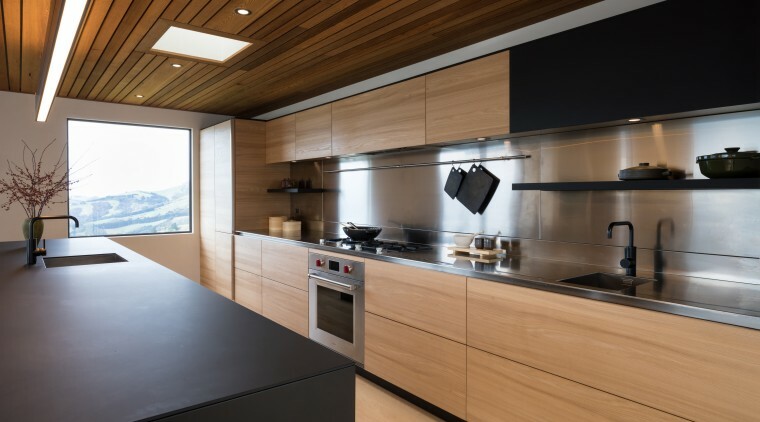 The warmth of wood meets the cool of matt black and stainless steel in this kitchen by designers Alan Bertenshaw and Maria Pomeroy of Matisse. 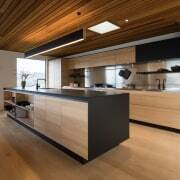 The kitchen accentuates long lines that work well with the wood batten ceiling and wood plank floors. 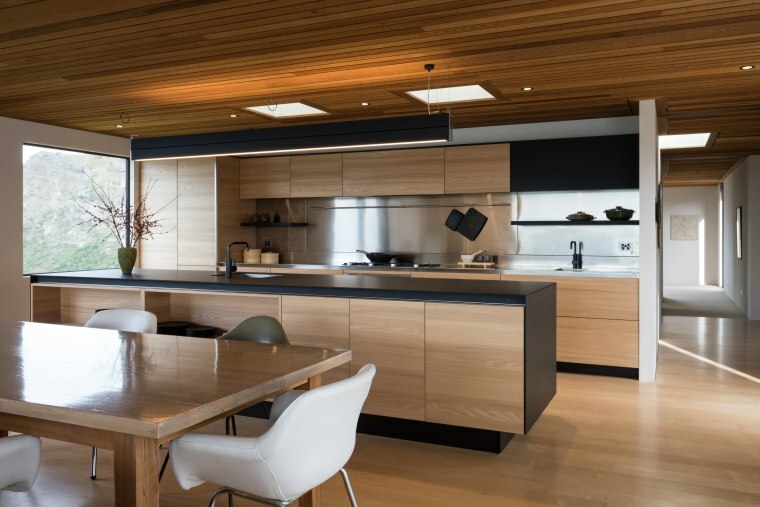 The pendant light over the island was custom designed to length to further highlight the long, linear nature of the design. Nature is famous for its lack of straight lines, so how exactly do you create a clean-lined kitchen that reflects an organic feel? Texture and tone are two good places to start. 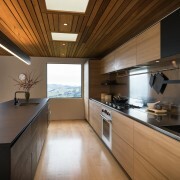 This sleek kitchen, by the Matisse design team headed by Alan Bertenshaw and Maria Pomeroy, was created for a Christchurch home nestled in the Port Hills. “The owners asked us for an organic aesthetic that would be in keeping with the sweeping bush outlooks, rather than something too symmetrical and fussy,” says Bertenshaw. “In addition, the couple wanted the kitchen to be harmonious with the exterior of the home, which was built from stone and wood, with hints of copper. 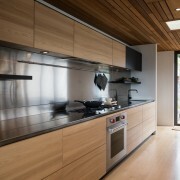 To achieve all these things in one space, the choice of the right balancing cabinetry and feature elements was crucial. 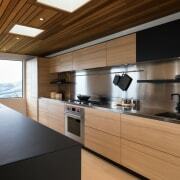 Part of the calm, restful appeal of this kitchen is that the designers visually downplayed its functionality. Pomeroy says they chose Arclinea’s Gamma series to create a seamless feel. 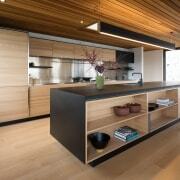 This cabinetry style boasts simple, clean lines with recessed handles incorporated into the structure of the benchtop. The minimalist cabinet style is in two finishes, the predominant surface being a natural touch finish veneer timber in Elm, which is both refined and tactile. This warm surface harmonises with the maple floors and rough sawn cedar ceiling as well as the exterior of the home itself. 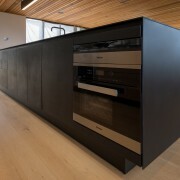 “We contrasted the generous use of wood with soft matt black surfaces on the island, the benchtop, the toekicks and at one end of the upper wall cabinetry where it helps avoid a strictly symmetrical look,” says Bertenshaw. 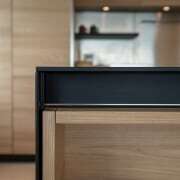 However, while the matt black absorbs light, the kitchen designers’ choice of a combined stainless steel rear benchtop and splashback adds soft reflections. Flush sinks and a hob welded flush into the rear stainless steel benchtop contribute to the pared back look of this kitchen by the Matisse design team. 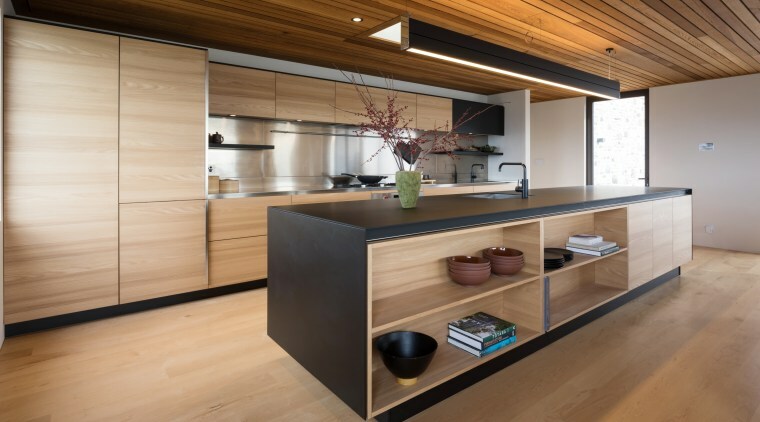 As well as sharing material harmony with its surroundings, the cabinetry’s linear nature ideally complements the lines of the plank floor and batten ceiling. 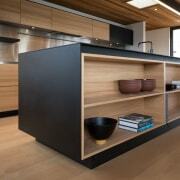 “Long cabinet drawers were chosen to maximise storage and to accentuate the kitchen’s horizontal lines,” Pomeroy says. The kitchen achieves the tranquil, Zen-like feel the owners hoped for through its use of natural surfaces and also by playing down its broad functionality. The fridge and pantry are integrated, the rangehood is hidden in the upper cabinets and the hob and sinks are set flush in the benchtops.